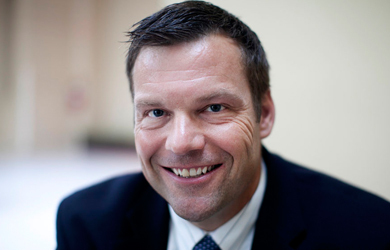 Kris Kobach is the brains behind some of the most notorious voter suppression and anti-immigrant measures in the country. He also has a day job as the secretary of state of Kansas. That’s why we’ve been closely following Kobach’s attempts to implement one of the nation’s strictest voter ID law in his own state — it offers a glimpse into what voter-suppression advocates would like to see throughout the country, and what voting rights proponents fear. This year, Kobach is implementing for the first time a law that he encouraged the state legislature to pass in 2011 that requires Kansans to present one of a narrow set of proof-of-citizenship documents (such as a birth certificate or naturalization certificate) in order to register to vote. So far, it’s been an unqualified mess. Two weeks before the state’s primary election, 19,000 Kansas voters still have incomplete registrations. On top of that, Kobach has implemented a two-track voting system so that people who fill out a federal voter registration form but don’t provide the extra citizenship documents are allowed to vote only in federal elections. Even voters who dig up the correct documentation and follow the instructions laid out by Kobach’s office have reported problems with getting that information to elections officials. The debacle has drawn Kobach a Republican primary challenger, Scott Morgan, who has criticized the secretary of state for the voter-registration disaster and for the large amount of time he spends working on his pet projects in other states. Last weekend, Kobach and Morgan held a debate, at which Kobach once again repeated his philosophy that if 19,000 Kansans aren’t finished with his byzantine voter-registration process, it’s just because they’re procrastinators who don’t care enough to vote anyway. In the three years after Arizona passed a similar law in 2004, 30,000 people were turned away from the polls.